In our hospital we often have problems with computer network cables. Cables tear because of poor material quality or bad installation or were gnawed by animals. The new installed cable then does not work because the crimped plugs do not have contact or the sequence of the wires are wrong. With the following small tester we can now easily check LAN network cable (RJ45, RJ11) for continuity, short-circuit and the new assembled cables can be checked for the right sequence of the wires. The tester is also useful to identify the right cable when several identical cables exist. 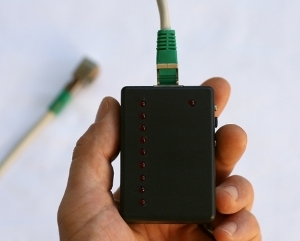 The tester consists of two parts, the actual tester with the LEDs which is connected to one end of the LAN cable and a passive part, a terminating socket which is connected to the other end. A network cable consists of 8 wires plus sometimes the shield. These 9 connections must be tested one after the other, otherwise a short between two wires or more can not be detected. 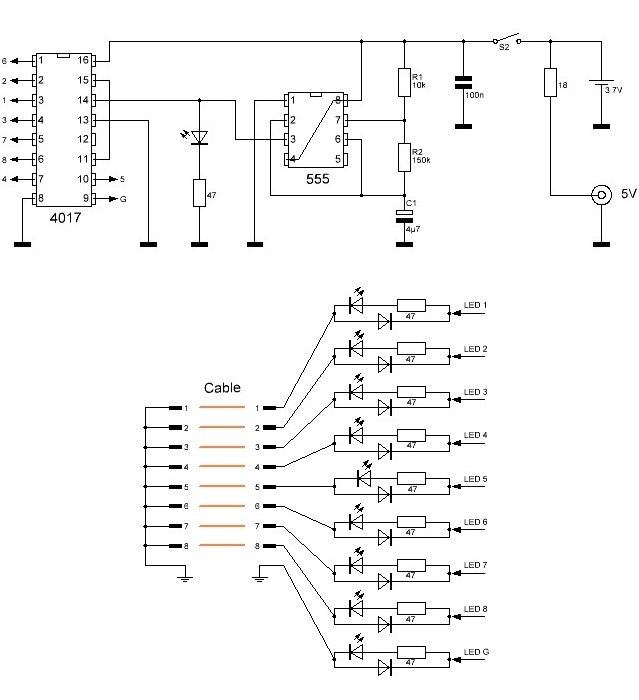 This sequential testing is done automatically by multivibrator and a shift register. In principle the circuit is a running light with the LAN cable in between. If one wire is disconnected, the corresponding LED will not light up. If two wires have a short-circuit two LEDs light up and if wires are interchanged the sequences of the LEDs will be also interchanged. 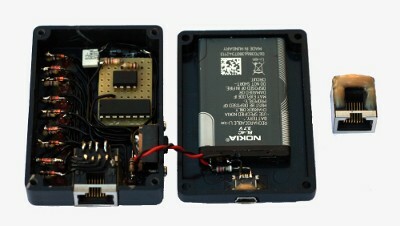 The Timer 555 operates as a clock oscillator. The frequency is determined by C1, R1 and R2 and here it is about 1Hz. That means, the LED at the output (3) flashes every second. 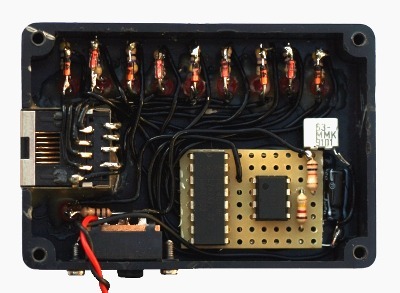 The signal clocks the decade counter divider 4017. The result is, that the outputs are switched sequentially from low to high. Output 9 (11) is connected to Reset (15) so that the counter starts again from the beginning when reaching output 9. Note that only the active output has high signal while all the others are low, that means ground potential. Now the tricky part. Let's say output 1 is high. The current now flows through the series resistor and LED 1 (the diode parallel is in reverse direction and has no influence), through our network cable and then trough all other wires back to the tester, because all other outputs now have ground potential and all other parallel diodes are now in forward direction. That also explains why all pins of the termination socket are connected together. The construction in principle is easy. A PCB is not needed, a dot matrix board is enough. The LEDs can be glued directly in the lid of the housing, the series resistors and the reverse diodes are soldered directly to the LEDs. The assembling gets easier, the bigger the enclosure is. Mine is almost too small. For the ICs better take sockets. LEDs, charge socket and battery are glued in the housing with two-component adhesive. Also the pins of the terminating socket I have sealed with two-component adhesive. For more information about RJ45, RJ11, LAN cable at wikipedia. Here my calculator for Timmer 555 applications.